I have had an idea for a skibike touring holiday bubbling around in my head for the last couple of years, I imagined something very different to the typical package ski holiday. On my perfect skibike holiday you would visit not just one, but many resorts, without the need to ever ride the same run twice, unless you particularly wanted to. You would cover huge distances and see so much varied terrain, from mighty high peaks, down to gentle wooded valleys. 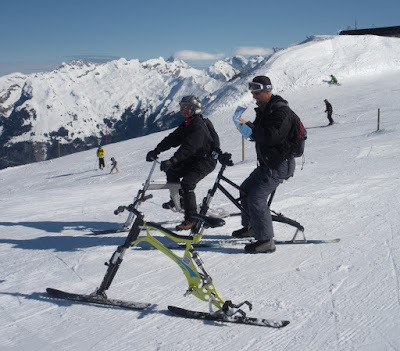 Riding skibikes, one wouldn't get burned out in the way a skier or snowboarder would. Returning home at the end of the week, you could recite a list of of the places you visited, listeners would think you had spent a whole season away, rather than a mere week. My ideal location would be somewhere in or close to the Portes du Soleil, 12 resorts spanning France and Switzerland and the largest international ski area in the world. It has an enormous variety of slopes both around the treeline and above. There are gentle, wide open runs for beginners, endless intermediate terrain and for advanced skiers, there are demanding bump runs, plus a huge choice of easily accessible off piste and many hidden gems. 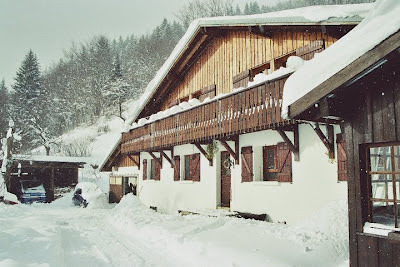 My ideal accommodation would be a cosy mountain chalet that offered breakfast in the morning, a slice of cake or two in the late afternoon and a hearty meal with wine in the evening. A secluded natural location with stunning views would be a bonus. It would need to be located roughly an hour from Geneva airport. Needless to say, transport would be necessary to get everyone around, a mini bus with a trailer for the skibikes would be the ideal vehicle. It would need to be available for transfers to and from Geneva airport. Much research has lead me to Haig Ski who offer; half-board chalet accommodation, transport and guiding throughout the Portes du Soleil and environs. Based at the quiet village of Le Biot, they are just 80 minutes from the airport. The proposed date for the first ever skibike touring week is Sunday 6th to Sunday 13th January 2013. This period leaves Christmas and New Year free for your familly activities. 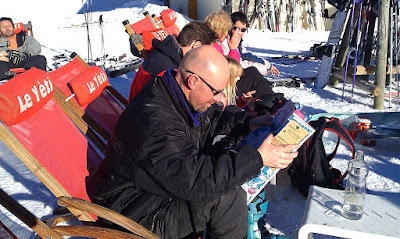 It is a great time of year to be on the slopes; there is little in the way of crowds or queues, the lift operators aren't stressed out and good snow is as near to guaranteed as is possible. 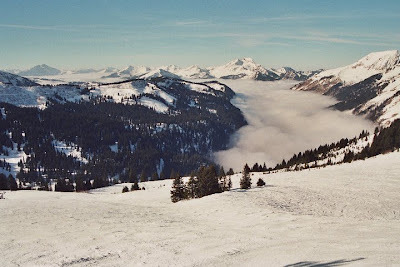 The Portes du Soleil - Doors of the Sun often live up to their name, whilst better know resorts shiver, this area often experiences mild clement days in between fresh dumps of the white stuff. Budget Flights from UK to Geneva - £150 (Easy Jet LGW to GVA, with 20kg baggage plus a "bike" carried as sports equipment. If you bring your own skibike, don't require lessons and don't intend to paint the town red every night, you would be looking at a budget of just under £1000. Remember, this is a fair estimate of your final cost, including all the hidden items that the glossy sales brochures omit to mention. Prices have been calculated in Pounds Sterling, to convert to Euros or other currencies here is a handy on-line calculator. I have 6 skibikers who have already expressed an interest in joining this tour, if they all commit, this would leave only 1 space free, so if the idea of a skibike touring week appeals to you and you would like to join, please contact me as soon as possible. Lastly, in the interest of fairness there are a few caveats to consider. Accommodation costs are based on 2 people sharing a room. There can never be a true guarantee of snow, but this area has a consistently good snow fall record and a micro climate influenced by its proximity to the Mont Blanc, which means "White Mountain" owing to its permanent snow cover, it is the highest mountain in Europe. Resorts can be notorious fickle with regard to skibike access, it may be necessary to change plans at short notice to concentrate on skibike friendly resorts. Rest assured that I will be in the area in the weeks preceding the tour and will be able to verify what is practicable. In order to take your skibike on a chairlift it will need to have an "AVEL" sticker; as of the 2011-12 season, these were available for some of the models produced by the following skibike manufacturers; Brenter, FiremVS, SnowScoot and Winter X Bike. If you are planning on bringing a skibike that doesn't have an AVEL sticker please contact me for further information. Exchange rates vary, therefore the final cost of your trip may rise or fall substantially.